The objective of this post is to raise a pressing question that has been bouncing around in my head since at least early 2013: Do adult American Herring Gulls show any appreciable amount of variation in their gray upperparts? Currently, the Kodak Gray Scale (KGS) value given for this taxon is 4-5 (Howell & Dunn 2007). For all intents and purposes, a one-point difference is typically thought of as minimal and negligible at best. Are there, however, adult smithsonianus individuals with KGS values that are potentially greater than 5? Intraspecific variation in gray upperpart color is well known in many gull species. 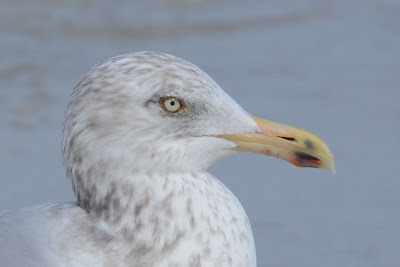 Some remarkable examples that come to mind include, but are not limited to, Western Gull (wymani versus occidentalis), California Gull (californicus versus albertatensis), Lesser Black-backed Gull (graellsii, intermedius versus fuscus) and European Herring Gull (argentatus versus argenteus). These are subspecific examples, and in most cases, there are distinct ranges involved. Adult aregentatus (front) with a typical argenteus (back). Katwijik, Netherlands. January 2018. Photo courtesy Mars Muusse. 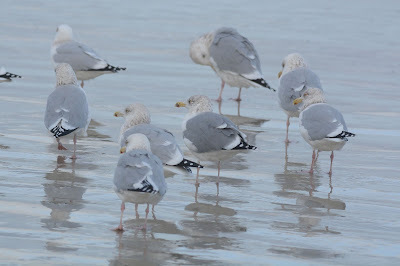 Consider, however, a monotypic species such as Slaty-backed Gull (schistisagus) with a reported KGS value of 9.5-11.5. A two point difference is noteworthy when one compares palest and darkest extrema. 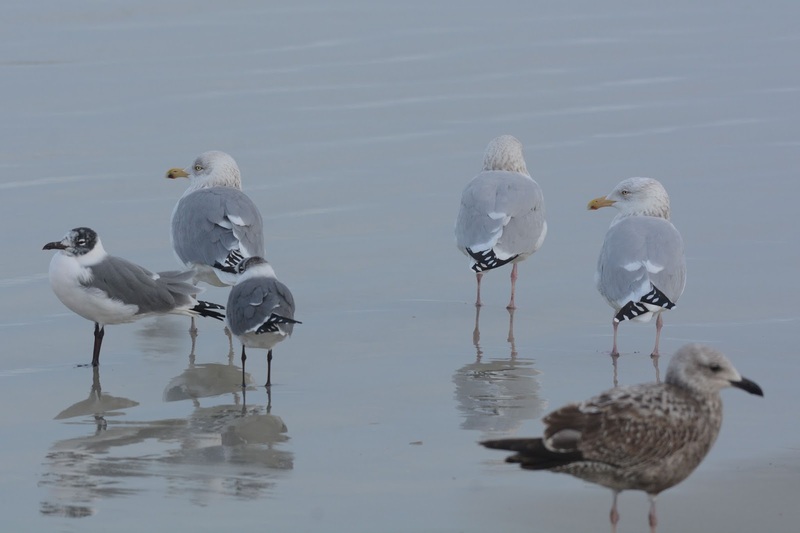 The species is a bona fide black-backed gull, such that the occasional pale individual - potentially matching a pale graellsii Lesser Black-backed Gull - often raises doubt and confusion as to whether a hybrid is at hand or simply a pale-end bird. 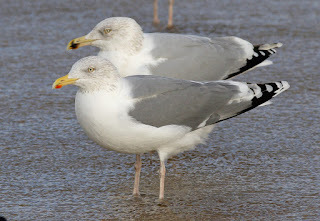 Britian's first Slaty-backed Gull is of a paler individual. Greater London. January 2011. Photo courtesy Dominic Mitchell. 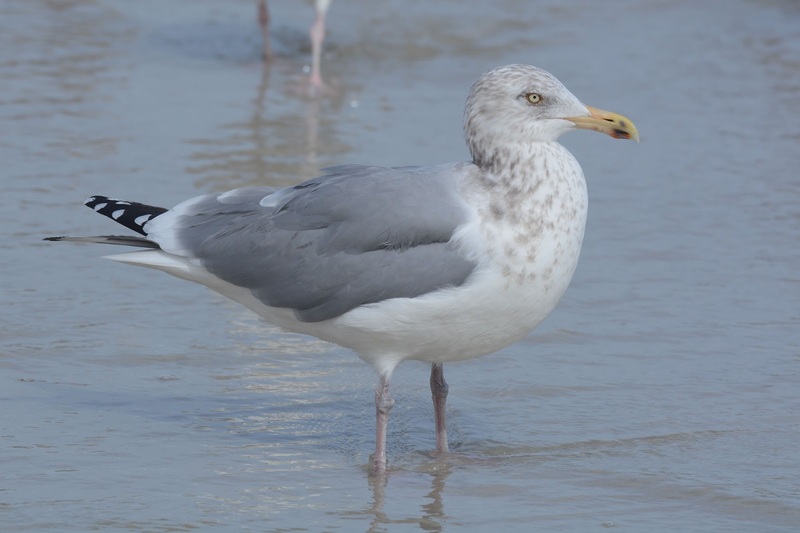 Although widespread and the most abundant pink-legged species in North America, American Herring Gull remains largely understudied. 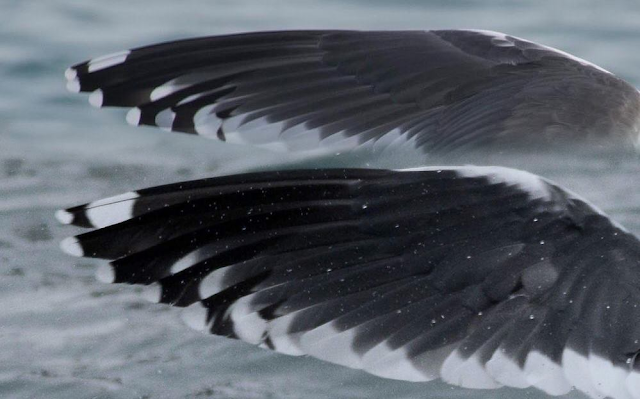 Some authorities have suggested at least 2 distinct populations may exist, based on size & proportions, and wingtip primary patterns. However, I know of no exhaustive efforts that have been made to formally describe these types in known breeding colonies. Further, and most relevant to this post, little data is available on extreme dark-end and pale-end smithsonianus adults. Again, another consequence of little data from known-origin birds. Below, I present 3 adult type Herring Gulls from east-central Florida. Each appeared to be 1.5-2 shades darker than surrounding adults. 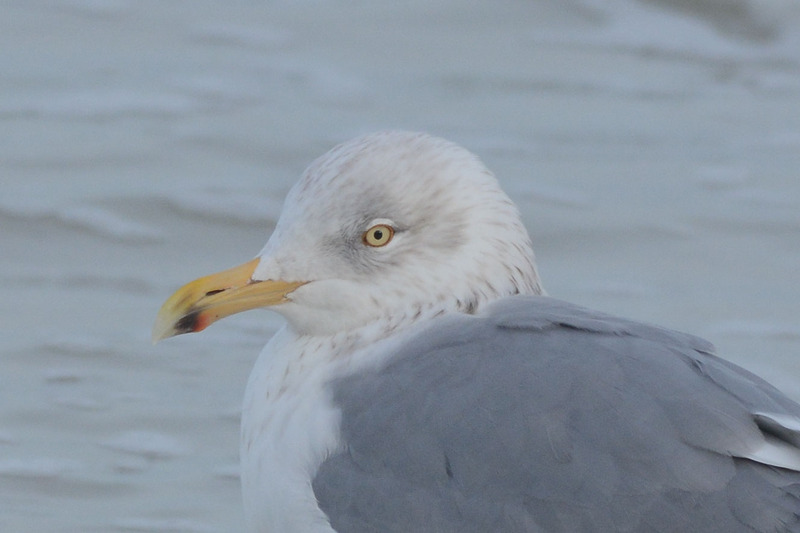 Note that the bare parts are in line with Herring Gull, as are the wingtip patterns. All 3 birds were observed between 24-28 January 2018. 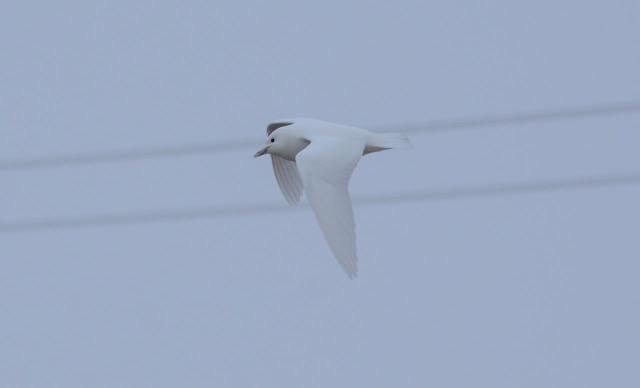 The darker upperparts were striking, allowing me to easily refind them with the naked eye. In the center of the frame. Left of center. Seen here with a large Herring (right). Inner secondaries still not fully grown. 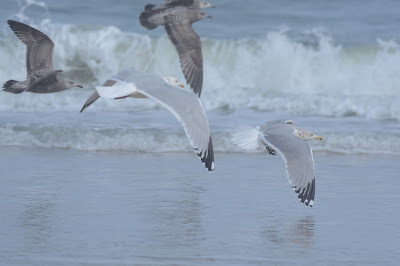 Seen on left with two Laughing Gulls. 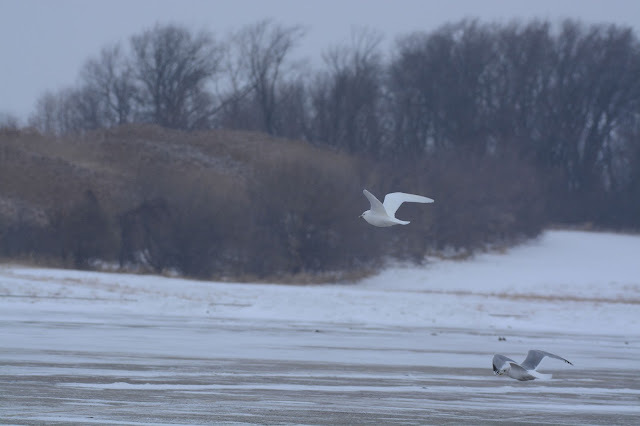 On left with wings fully raised. The most important question to begin with is why aren't these hybrids/backcrosses? 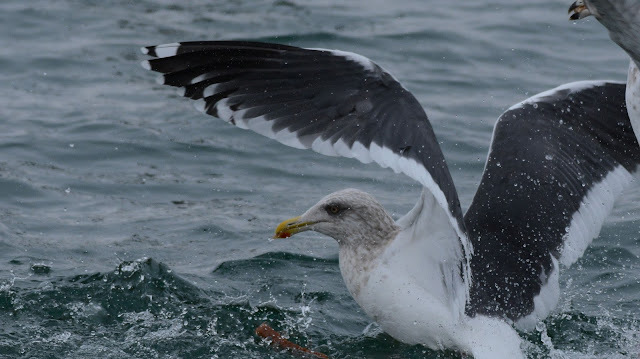 Great Black-backed x Herring and/or Lesser Black-backed x Herring are the most likely dark-backed Herring hybrids. I'm not ruling out that possibility. But outside of the darker upperparts, there are no obvious hybrid characteristics. 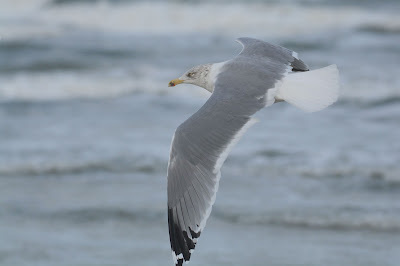 As noted above, all bareparts (leg color, bill color and orbitals) are within range for American Herring Gull. The primary patterns also belong to smithsonianus. There may be some distant genes responsible for the darker grays we see here, however. As for other taxa to eliminate, Vega Gull comes to mind when we think of darker Herrings with pink legs. I feel confident in eliminating Vega Herring based first and foremost on the orbitals. I don't know of any examples where Vega has been documented with an orange orbital. If this is nothing more than variation found in smithsonianus, why isn't it detected/reported with more frequency? Perhaps many of them are written off as hybrids. It may also be a matter of not appreciating these differences in the field. 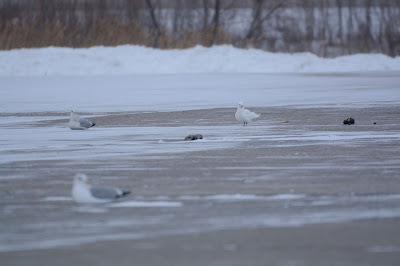 I must admit, I've not detected such dark birds in my Herring flocks in the Lake Michigan region. Another bird I've been meaning to journal, this presumed Great Lakes Gull (GBBG x HERG) was a real looker. Upperparts are 1-1.5 shades darker than Herring, and certainly closer in color to that species than Great Black-backed Gull. It had a piggish look to the face with a large blocky head, giving the impression of GBBG. The bill is strong and thick all throughout its entire length like many GBBG. Body size was closer to Herring, but it appeared long-legged when walking with a front-heavy posture, holding its back horizontal. Lake County, Illinois. 03 January 2018. I briefly observed the open wing which only displayed a mirror on p10 with a moderate amount of black on the inner webs of p8-p9. 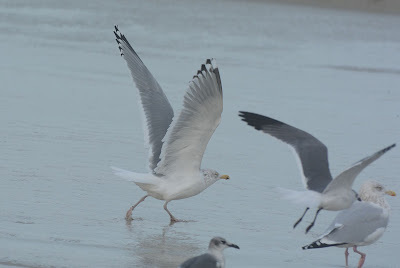 The wingtip shows more black than most other putative Great Lakes Gulls I've seen. 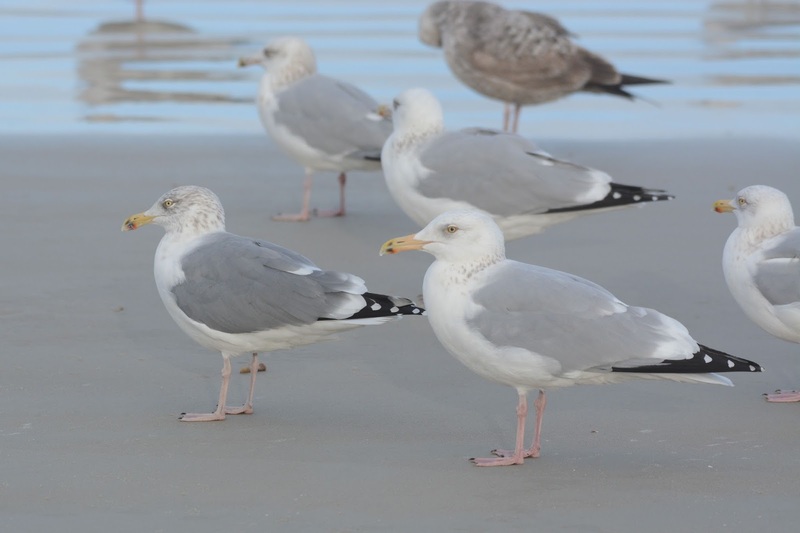 Those individuals, incidentally, were also darker with upperparts more intermediate or tending toward GBBG. 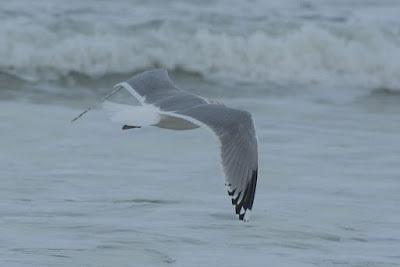 Thus, I'm assuming the wingtip is due to more Herring influence. The Lake Michigan region seems to be reporting about 10 Great Lakes Gulls per winter season. 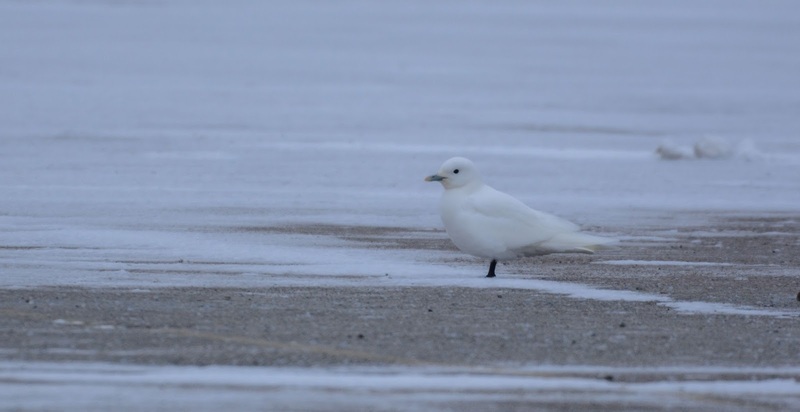 I have only seen this hybrid once in the breeding season, an adult in Manitowoc, Wisconsin (July). With reports of this hybrid - and many other putative hybrids - being predominately of adult individuals, I do wonder what 1st cycle Great Lakes Gulls look like. 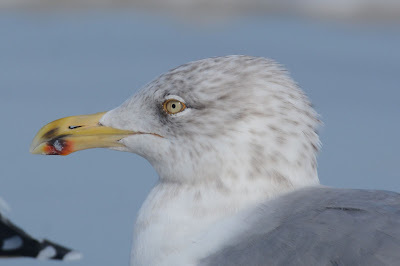 I have been meaning to post this adult Ring-billed for a while. 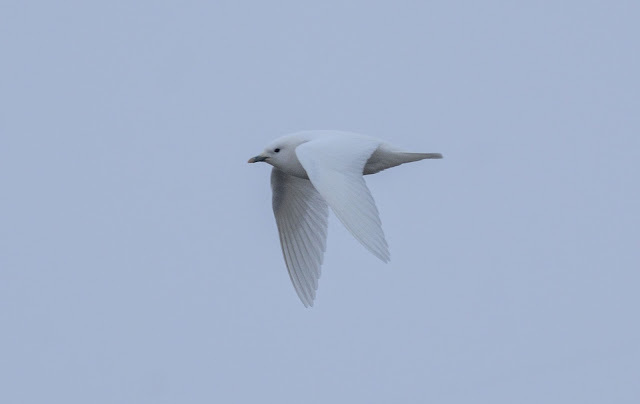 It ranks up there with the most white-winged adult I've personally encountered. It shows a large p10 mirror, thayeri pattern on p9 with mirror extending from edge to edge, and an unmarked p5. Interestingly, it shows a pseudo-mirror on the underside of p10, near the base of the black wedge on the inner web. Chicago, Illinois. 09 January 2018. Photo by Carl Giometti. 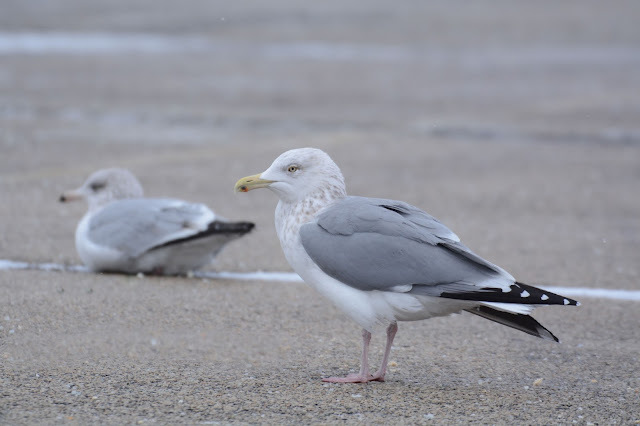 Chicago bird (top) & Pleasant Prairie bird (bottom). Courtesy Greg Neise. The shortest distance between the two sites. In particular, consider the pattern of the black subterminal band on p5. The wingtip is a perfect match! So what's the distance from the RecPlex in Pleasant Prairie to Calumet Park in Chicago? 60 miles. Well, 59.45 miles to be exact. Of course the bird very likely took a much more interesting route getting down here. This is not the first time we've detected our winter gulls roaming the southern Lake Michigan region. 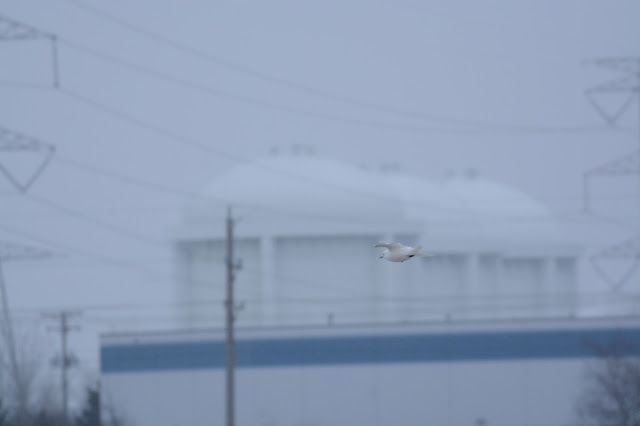 The food source is "landfills" and any disruption in the food source (i.e., closed for Christmas, or closed on Sunday) readily gets the birds moving. As my friend Greg Neise described it, "100 miles is nothing to them. It's like us going to check out a new restaurant in the next suburb over". 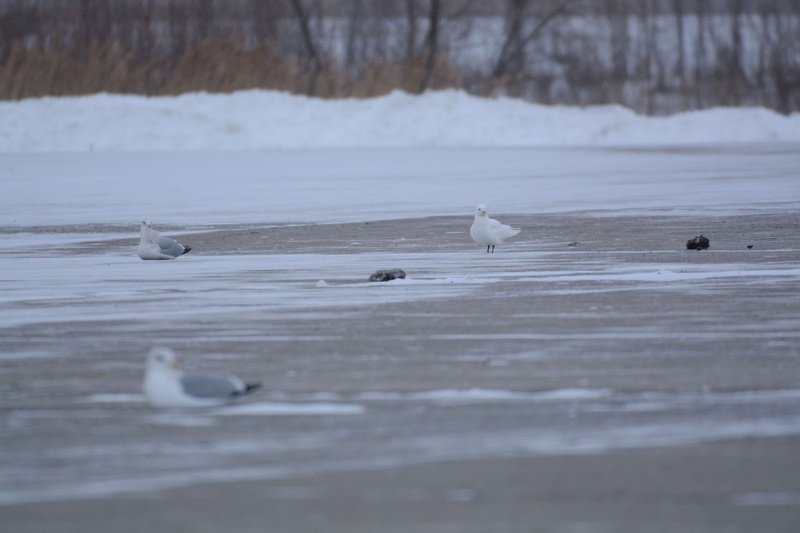 It remains to be seen if the Calumet Park bird found by Carl is the same bird currently being seen on the Calumet River. 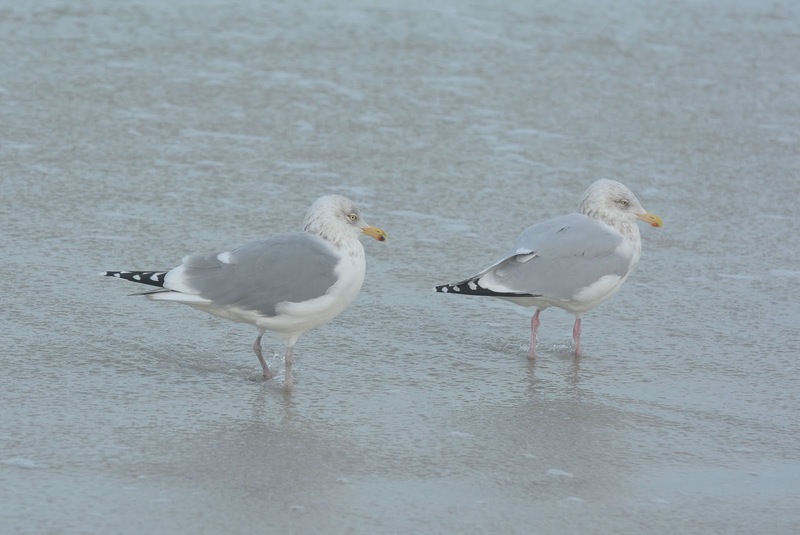 The consensus seems to be "same bird" and I agree completely. An amusing phenomenon takes place today - birds graduate! 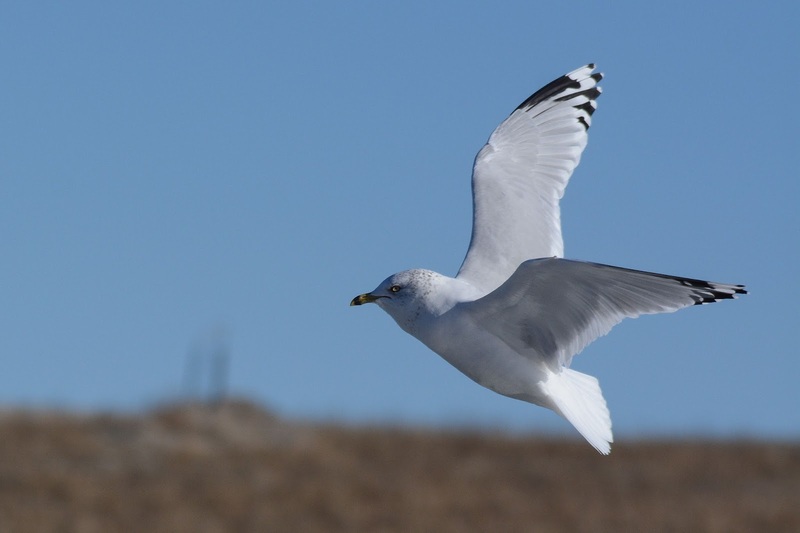 1st year gulls (i.e., 1st calendar year) have graduated to their 2nd calendar year (2nd cy*). 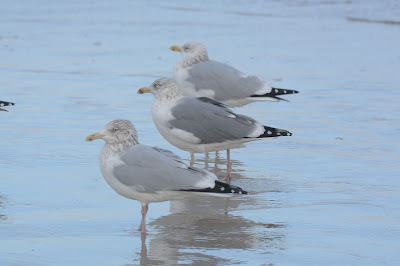 2nd year birds have graduated to 3rd year (3rd cy), and so on and so forth. This "calendar year" system is often the preferred aging phraseology used in much of the Old World. Some birders - many from the school of the great Peter Grant - are accustomed to using seasons to describe a bird's age: 1st winter, 1st summer, 2nd winter and so on and so forth. 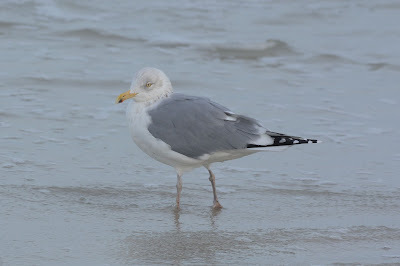 So a bird that was labeled as 1st winter yesterday (December 31st) is still a 1st winter gull today (January 1st). At some arbitrary point in the next few months, this bird will be referred to as "1st summer" (Note that the season a bird hatched in is not designated as its 1st summer. 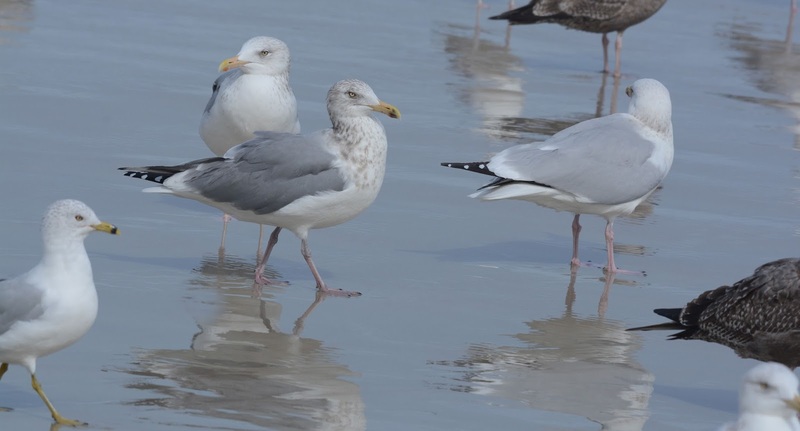 Hence, a bird in its 2nd calendar year will be labeled a 1st summer gull this upcoming June). The season system gets sticky in instances where transequatorial taxa are in question. 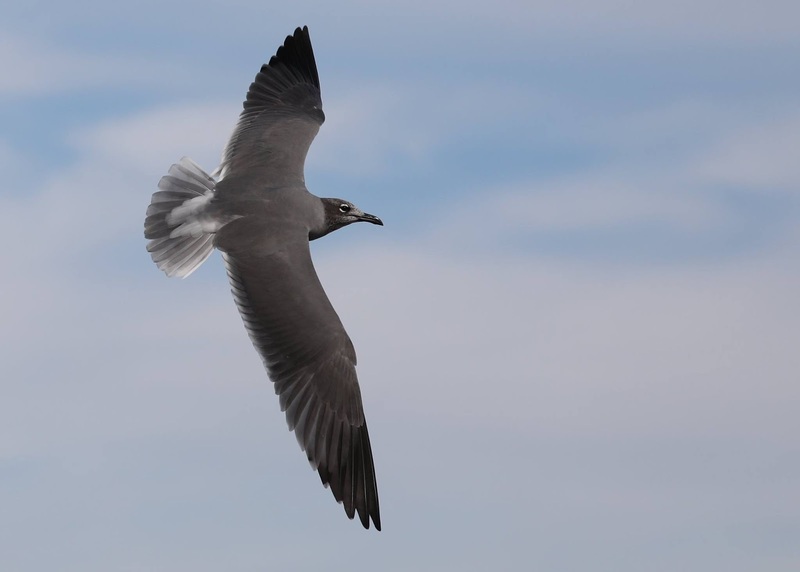 For instance, a "1st winter" Sabine's Gull seen off the coast of California in November, and then found off the coast of Peru a few weeks later, will be in the company of resident species being referred to as "1st summer". An increasingly popular method for "aging" birds - one that is based entirely on molt cycles and the plumages they produce - is the Humphrey and Parkes system (H-P; Auk 1959). 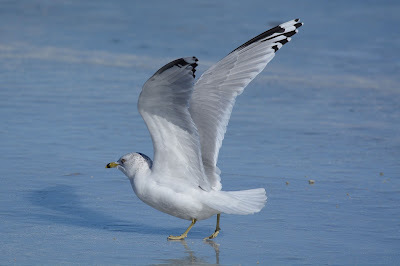 Here, the focus is not on where or when a bird hatched, but rather, which feathers are being replaced and what happens thereafter in subsequent molts. Two broad molts are the basis for this system: prebasic and prealternate. 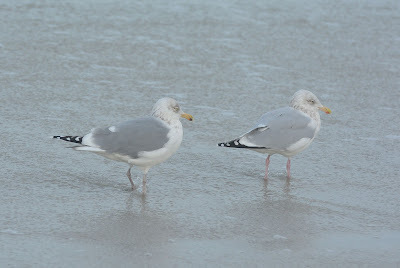 Prebasic molts produce basic plumage, and prealternate molts produce alternate plumage. 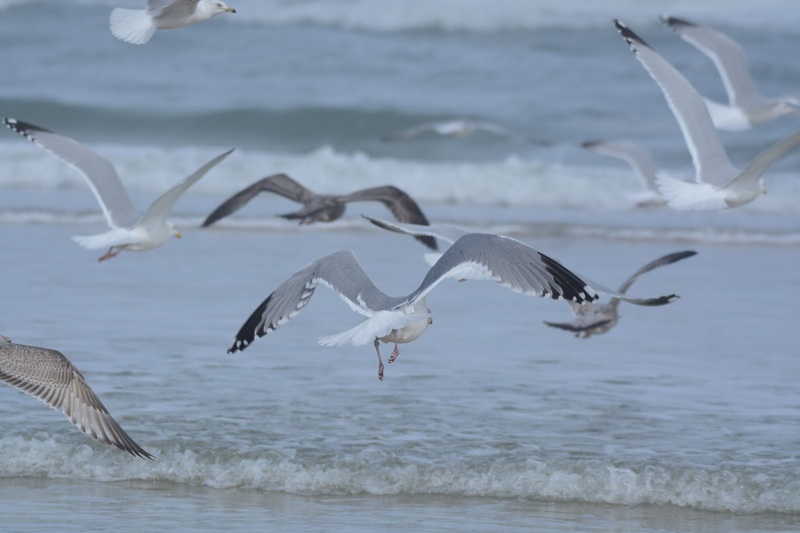 The H-P system avoids using "breeding" and "nonbreeding" to describe plumages as there are large inconsistencies in those terms. For example, are your local male mallards with green heads in breeding or nonbreeding plumage? 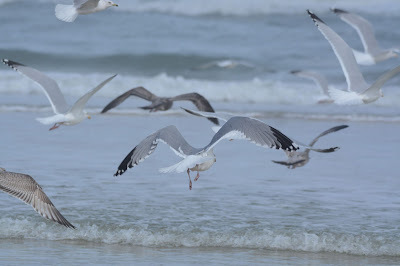 Consequently, it's not very helpful to associate a bird's biology with its molts. The H-P system was revised by Howell et al. 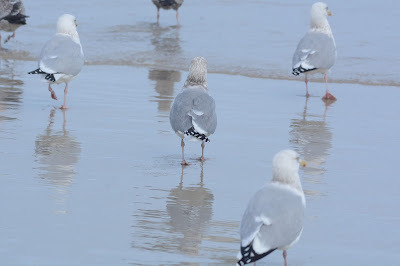 a few years ago to promote congruencies across species based on events that take place in the 1st plumage cycle. There are four molt strategies that have been outlined in this revision (which is beyond the scope of this post). 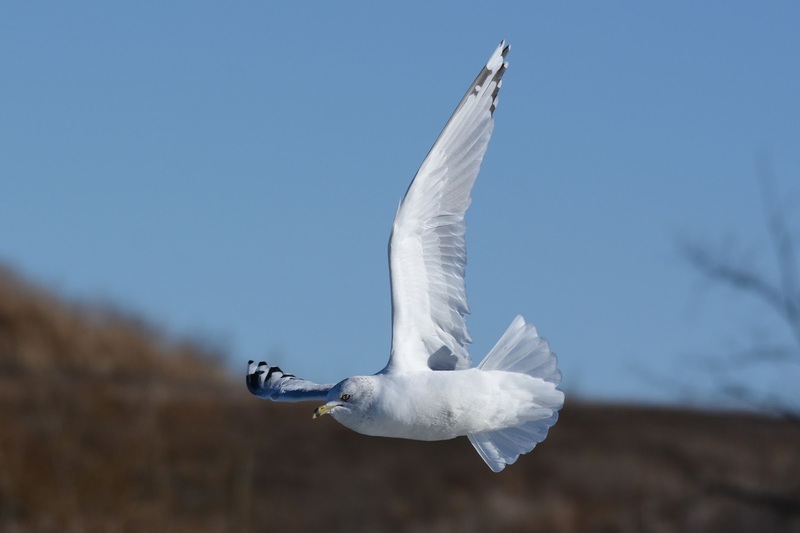 The results of this modification nicely sort most bird populations by molt strategy. One ambiguity with this system, however, is when the next prebasic molt commences. Let's consider a group of three gulls sitting together on a beach in Chicago during the breeding season. Suppose two of them hatched the previous year and one is a juvenile that just recently fledged. 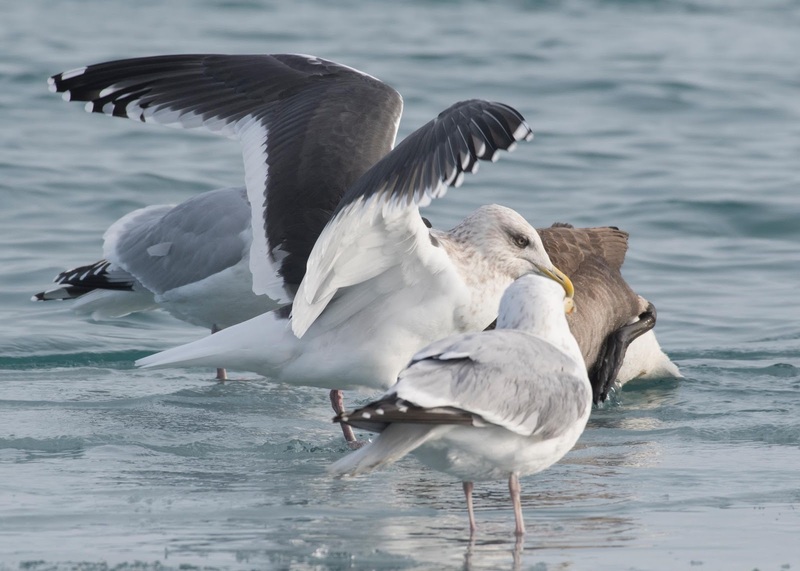 It's perfectly acceptable for one of the 2nd calendar year birds and the juvenile to be labeled 1st cycles, whereas the other 2nd calendar year bird may be labeled a 2nd cycle (simply because its next prebasic molt has commenced). Thus, it's not always obvious to a birder - without descriptions or photographs - which age cohort is being referred to when reading these things in print. 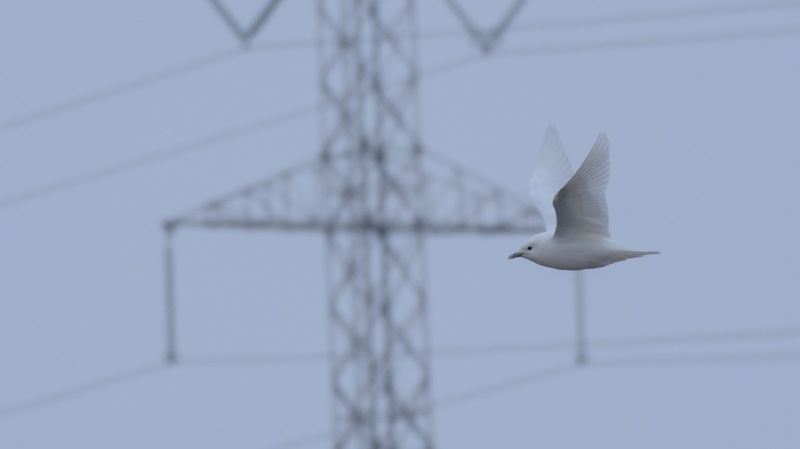 The H-P system is not designed to tell you how old a bird is. No system can without the use of a physical marker. 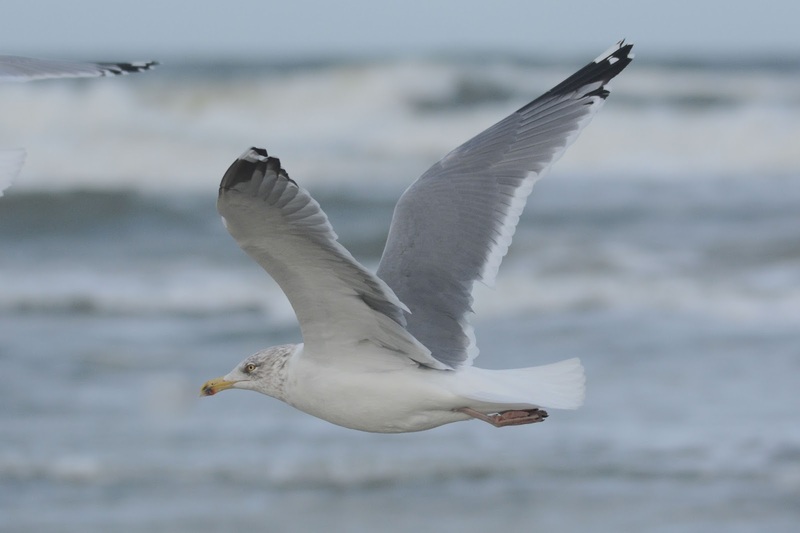 Nor does the H-P system tell us whether a bird is in breeding or nonbreeding "plumage", but it does employ "aspect" as a way to describe the appearance of a plumage. There are pros and cons to each of the systems above, but in my opinion, the H-P system - although somewhat didactic - is the closest thing we have to unfailing. A clarification note, Calendar Year is denoted by "cy", and this does not equate to "cycle". Thanks to Chris Corben for some helpful comments on this post.